← Searching – 90’s Eden WHITE SLEEPING RABBIT Thermal Body PINK PLASTIC NOSE Lying Down? My little girl is thoroughly attached to her little lovie, that we’ve named Sheepy. 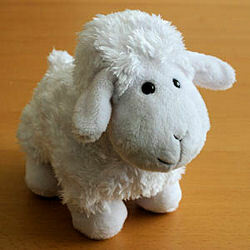 Sheepy is approximately 6.5 inches tall, 4 inches wide (not including ears) and about 8 inches in length from nose to tail. His fur is soft and shiny, likely Rayon, and is stuffed with a soft polyfill filler. The face and feet are a standard short hair plush that is matt. He’s got a big head and a big smile and shiny black eyes. Mine does NOT have a sound chip, although I think it may be from the same breed as Katty’s, which does. I originally bought mine from Toys R Us (UK), but I suspect the manufacturer to be Best Made Toys based in Downsview (Toronto) Canada. I’m seeking a spare Sheepy as wash days (twice a week) are a traumatic experience, as she has to do without her Sheepy for several hours, and she cannot sleep without him. He is her love, comfort and joy, and I want to find a backup before it’s too late to start swapping them out. I’ve been combing the internet without success until I stumbled on this site and someone else (Katty) looking for what I think is the same critter (she calls hers ‘Lambie’). Hopefully some of the info/photos I’ve provided can help both of us. I have set up a flicker set dedicated to Sheepy. The photos with the ruler are Sheepy’s current state after much love from a 1 year old, and the main set photo (without the ruler on a wood background) is the photo of Sheepy brand new. I hope somebody can help both myself and Katty with this info. If you can help Chriss find this Best Made Toys? Big Head White Lamb, THIS SITE IS NO LONGER ACTIVELY MANAGED. Please use Our FREE FACEBOOK GROUP, including #101608-1 in the subject, . #101608-1 Yes, I measure our lambie, they measure the same. I am very encouraged by your find, which means every few years the company will re-made the same lamb for Easter. 🙂 Our lambie is already 5 years old. Is yours 2 years old? Wouldn’t that be wonderful if BOTH of you could get some this coming Easter??? It would be fabulous if we could both find one. I hoped that the as new photo might be of help. I received word this morning from someone who no longer needed help finding a lovie, because Best Ever told them it would be sold again this Easter. Maybe you two will be that fortunate!!! Item number: 360034495748 ebay. very similiar lamb. worth a look. Nova brand. It certainly looks like the same lamb to me in a different color. So maybe Nova is a brand to watch for. Thanks Tami! Seems like we are all able to locate all the colors of this lamb except the white one. We already have the yellow and the purple lamb, just keep trying to find the white one. Update. My mum found another one in a wool shop in Canada. The shopkeeper said she had bought it several years ago and had no plans to buy more (or for that matter sell the one she had) but mum told her the story and we now have a backup sheepy. This lamb had a sound chip (which we removed) and all tags attached. The tush tag says it's from Best Made Toys Ltd as we thought. It would be great if they do release it again, but I wanted to pass on this info anyway. Katty, I hope this is helpful!! Thanks for all the great information, and congrats on finding one. Now if Katty could just be so lucky!! !